What I have said about the Yoruba people (see part II) is also true of many other ethnic groups in Nigeria. But, for reasons of space, I will only highlight the constructedness of Hausa, Igbo, and Ogoni. The notion of Hausa as a collective ethnic identity, particularly in its current form, is a decidedly colonial construction. The word “Hausa” is not even a Hausa word; it is the Songhai word for “east bank” or “left bank.” (The Songhai people, whom we today call the Zarma or Zaberma and Dendi of Niger Republic, are Hausaland’s immediate northern neighbors. Interestingly, according to historical sources, it was the sixteenth-century Songhai scholar by the name of Ahmed Baba al Massufi who first used the word “Yariba” in a scholarly article (written in Arabic) to refer to people in what is now Oyo, Osun, and parts of Kwara. In his own treatise on the Oyo Empire, Muhammed Bello, Usman Dan Fodio’s son and second Sultan of Sokoto, copied the name from al Massifi’s book and passed it down to Hausa speakers. Samuel Ajayi Crowther liked the name and adopted (and adapted) it as a collective name for people southwest Nigeria. The Songhai would seem to be prolific in naming our names in Nigeria). “Hausa” didn’t initially refer to an ethnic group, or even a language, but to a place. In Tarikh es-Sudan (Arabic for “History of the Land of the Blacks”) written in about 1655 by Songhai scholar Abd al-Sadi, “Hausa” denoted a place, not a people. Even in Muhammed Bello’s Infaq al-Maisur, written in 1812, “Hausa” wasn’t used as an ethnic identifier; it was the name for a region. The people called “Hausa” today didn’t self-identify as such until relatively recently. Dr. Yusuf Bala Usman also demonstrated convincingly that the pre-colonial caliphate in the North was not nearly as cohesive as most accounts of the period crack it up to be. It was a loose collection of independent states whose people only developed a politically consequential sense of collective identity during colonialism. The Onitsha Igbos, who considered themselves culturally sophisticated on account of their Benin-style monarchy, called their republican, “stateless” neighbors “Igbo” as an insult. It was only in the 20th century that the name shed its pejorative connotation and became a collective term for people in southeastern Nigeria. And British colonialists had a lot to do with that. Ogoni, in other words, is an exonym (a name given by outsiders) for five distinct but mutually intelligible language groups: Kana (or Khana), Gokana, Tee, Eleme, and Baan. 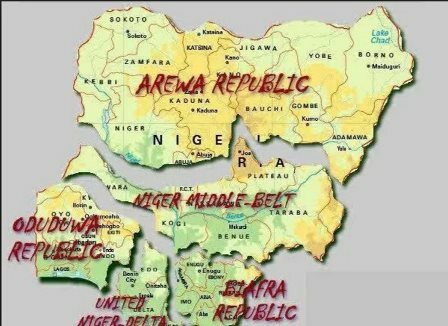 So, one of the ironies of ethnic nationalism in contemporary Nigeria is that it was inspired by British colonialism, which advocates of a “sovereign national conference” or of “restructuring” blame for the “forced” union that is Nigeria. The point of these examples, though, is not to suggest that ethnic groups didn’t exist before colonialism—or that organized ethnic self-identification and self-expression didn’t precede colonialism. To make that argument would be crassly ahistorical and even self-hating. My point, however, is that contemporary expressions of exhibitionist ethnic nationalism all across Nigeria—expressions that sometimes elevate and exaggerate collective fictions (such as the notions of the “Yoruba race,” the “Hausa,” the “Igbo race,” the “Ogoni people,” etc. ) and that sometimes deny the reality of cultural and linguistic sameness (such as the distinction without a difference between the Efik and the Ibibio whose languages are more mutually intelligible than Ekiti and “Yoruba” are)—are the consequence of our colonial encounter with Britain. In other words, exclusionary, maximalist, and expansionist notions of our ethnicity are a byproduct of the same process and structure that produced Nigeria. In a sense, therefore, our current ethnic identities are also a holdover from colonialism. Should we now reject these identities because they were "forced" on us by colonialism? Do we, perhaps, need to first renegotiate the basis of our colonially-inspired ethnicities before we renegotiate the basis of our nationhood? Where do we start and where do we end? And how do we want to do that, anyway? By bringing together a motley gaggle of perfidious, self-interested, and insular rascals with maximalist positions to shout at each in a so-called conference of ethnic nationalities? For me, that’s a disingenuous and intellectually lazy way to confront the delicate art of nation-building and statecraft. I agree that Nigerians should discuss ways to move the nation forward, but it is, to my mind, reactionary to begin talking, in the 21st century, about how we became a nation. What use is that knowledge to us? It's all too commonplace to deserve being dignified with a conference. It's not our “forced” union that's responsible for the ethnic tensions in Nigeria. Of course, it's too much to expect different ethnic groups to exist in one country and not have tensions. Tension is a basic feature of all relationships. There is no country on earth that does not have its share of racial or ethnic tensions—or secessionist threats. But the fact that Ife and Modakeke, who are all Yoruba, murdered each other for years on end is evidence that our “forced union” is not the problem here. The fact that Sunnis and Shiites, who are all Hausa, mindlessly killed each other in Sokoto a few years back should be proof that homogeneity in and of itself cannot guarantee a tension-free relationship. So is the age-old fratricidal Umuleri/Aguleri/Umuoba-Anam war in Igboland. Now, I don’t want to be misunderstood as suggesting that there is something sacrosanct or inviolable about the Nigerian state. Nigeria is not some pre-ordained, divinely inspired union that must not be tampered with. But the reasons often proffered by irredentists for contesting the basis of the union are intellectually impoverished. I personally think we have more reasons to sustain the union than we have to discontinue it.